A variety of events have happened in the last month that precipitated a journey. A journey for many reasons. A journey of necessity. Oftentimes things happen and we just know that we have to go; to explore, to commune, to be inspired, to make connections, and simply to expand our minds with a different landscape. It was such that I found myself back in Alaska. Back to where a piece of me will always be. 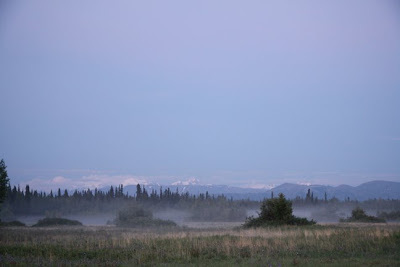 Now, perhaps I would sing a different tune if I wintered in Alaska, but I have a feeling my love for the place would grow even more as a result. These past few months have been filled with work towards my solo painting exhibition on Newfoundland, another place that I am deeply connected with. The work is coming along well, I am pleased with what has come out of the studio so far. Yet, I have been dealt a hand of cards that enabled me to travel for a time back to the North, to hike in the wilderness, to make new friends at a wedding in the Interior, and to generally continue my exploration of the 49th state. 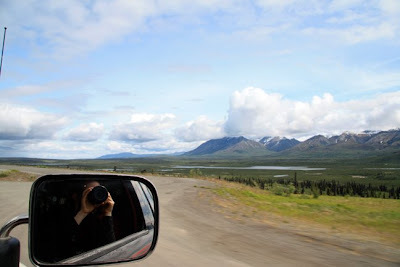 It took two days to get to Alaska this time, due mostly to a security issue at JFK en route to Salt Lake City, my connecting city to take me to Anchorage. 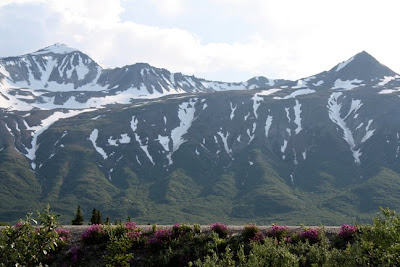 So the plan was to drive to Delta Junction to a fantastic wedding on a 1,600 acre ranch, then drive back down to McCarthy and Kennicott, leaving to hike and camp in the Wrangell-St. Elias National Park for a few days, ending off with a night camping near Valdez. Thus, much preparation was needed. 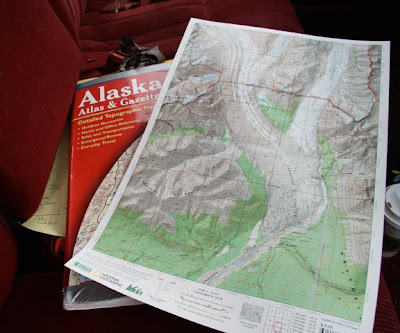 We assembled food, gear, maps, directions etc and headed out: we would cover 1,200 miles in just over a week, through some of the most beautiful land I have ever seen. There is a beauty and serenity to be found in the process of reaching a place. If we were immediately transported to a destination, would we appreciate it as much? 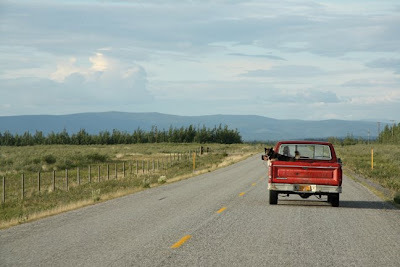 There's something to be seen in each curve of the road, because really, each moment and each mile along the highway is a destination too, or could be, depending on your plans and how flexible your itinerary is. To this end I made sure to keep my camera shooting and relished each hour as we made our way down to Glennallen and then turning north up through the Alaska Range, up into Delta Junction where the Alaska Highway begins, and down to the farm where Joe and Anna were getting married. 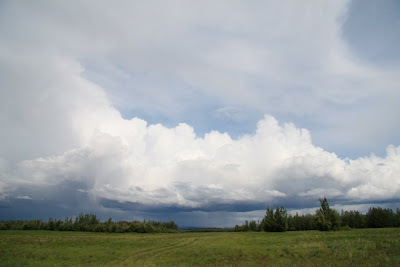 Michael and I stopped briefly at the Matanuska Glacier and then continued on down the highway, stopping periodically to witness storm fronts crawling across the sky, stretching and generally appreciating the drive. 7 hours passed quickly with so much to see and experience. 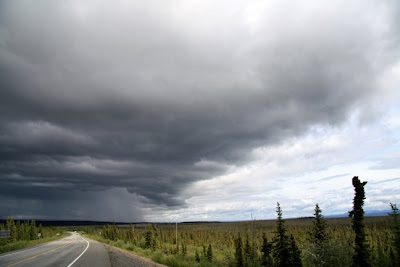 The weather in Alaska is very changeable, very! By the road near Castner Glacier for a brief rest. The flowers were blooming and the weather was perfect. 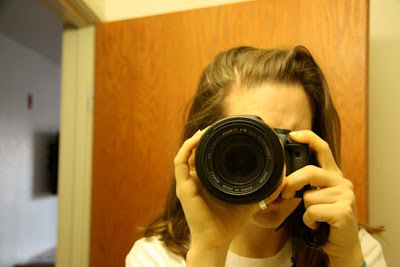 Travel and exploration makes me thirsty and also slakes my creative thirst at the same time. It is a double-edged sword of inspiration and longing too. This rare quality that at once makes you want to experience more and yet also stop to capture that magic and transfuse it into your work is one that I cling to and try to chronicle in these photographs. Whether I do paintings from them is irrelevant: it is the emotion and inward movement of the heart and mind that is important here. It is the mental reference and the impression on your soul that becomes food for later creative efforts. The landscape in the Interior near Delta Junction flattened out a lot. It was quite surreal. This farm was near where the wedding took place. 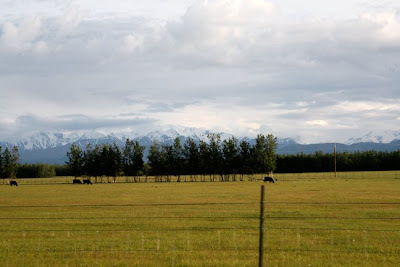 You can see mountains from the Alaska Range in the distance. I loved the vibrant ochre of the fields here. Traveling from an area so mountainous into an area almost flat beyond belief was quite a shock. It felt like we might be in Wyoming or some state in the lower 48. 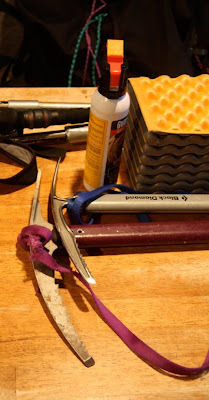 We marveled at how remote the farm was...off-the-beaten-path was an understatement! The driveway to the farm was even 1.5 miles long! 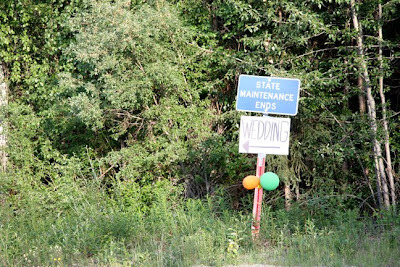 I like how the sign for the wedding was right next to the one emphasizing how darned remote the location was! Joe and Anna's wedding had folks arriving from far and wide. I met a lot of wonderful folks from Fairbanks to Oregon to Anchorage to Juneau. Everyone was welcoming and the ceremony was just beautiful! Such big skies! This is the path that led to the campground and area where the ceremony took place. 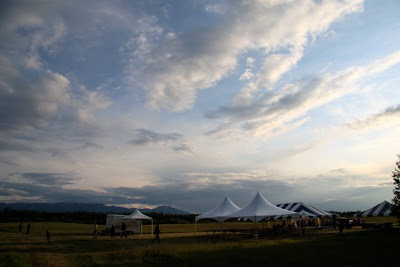 The entire wedding weekend was superbly organized with everyone setting up their tents and getting comfortable, helping out and generally enjoying one another's company. 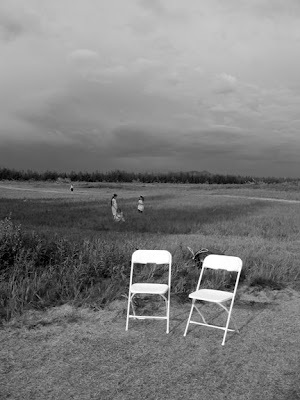 I kept feeling pulled towards the open expanse of air and space of the property...fields as far as the eye could see, large swathes of emptiness and also filled with life and nature buzzing all about, from the mosquitoes to the bees. It was quite remarkable and a far cry from my small, dark studio that I had left only a few days before. 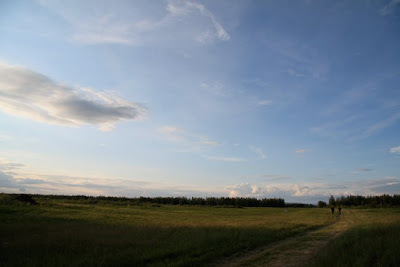 I took a few walks out to a crossroads of fields, 360 degrees of solitude and the quiet thrum of activity a field away. This evening was the Summer Solstice...so the sun never really set..it was disorienting and that added to the magical quality of it all. 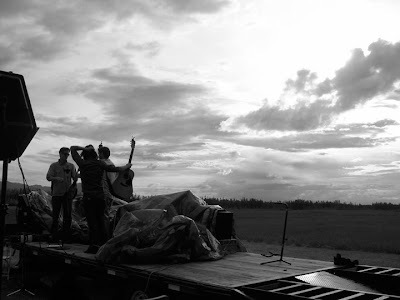 Here you can see guests setting up in one of the fields. I spent a good deal of time out photographing flowers, bees, the skies, and new friends. 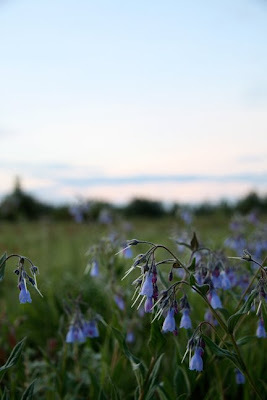 You never know what will catch your fancy, like these bluebells. Never before had I witness such a magnificent transition of light and time. Being up North really messed with my circadian rhythm. I did not know whether I was hungry or full, waking up or ready to sleep, winding up or winding down. This inner sensational schism perhaps added to the intensity of experience there, to the appreciation of that unique time and place. One thing is certain: it was one of the most special weddings I had ever been fortunate enough to attend. 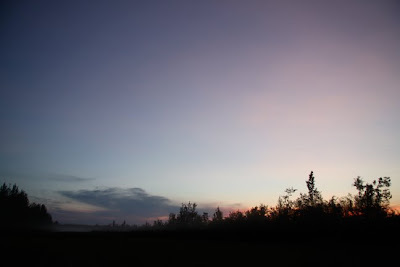 I was amazed at the colour variations in the waning light that never waned entirely. 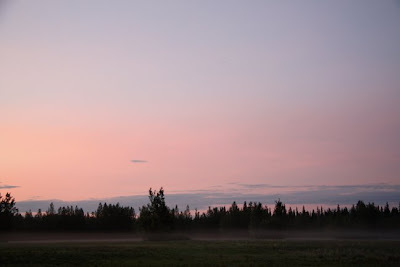 A mist appeared around 2am. The next day people awoke and made preparations for the ceremony at 3pm. The ceremony itself was fantastic. A poem by Pablo Neruda was read that moved me to tears. It was really quite emotional and Anna looked radiant in particular. It was wonderful to see everyone happy and rejoicing in that beautiful place. 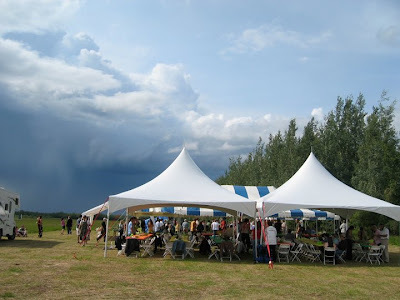 Everyone gathered for a great meal after the ceremony, the skies provided an exciting backdrop! reception. They were fantastic! You can see their MySpace page here. The band sets up before performing at the reception. differently, placing more of a focus on value than colour. 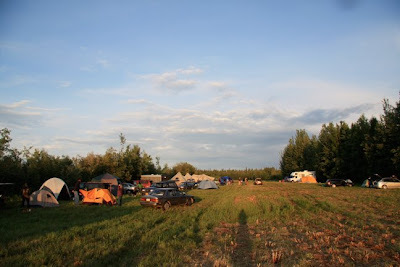 We spent two nights at the farm near Delta Junction. 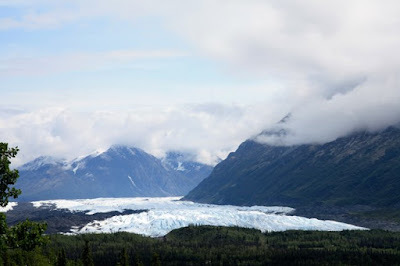 It was the perfect beginning to another adventure that would follow: a few days spent hiking in Wrangell-St. Elias National Park, a park larger than the country of Switzerland! Thus the wedding weekend was a lovely counterpoint to the rugged landscape in store for us in the upcoming days. Each guest received a green mug to hold one of the money home brews on tap at the wedding. At one point Joe said that they would have their 10 year reunion at the farm again and that as long as you had your mug you could enter. I'll hold on to my mug! 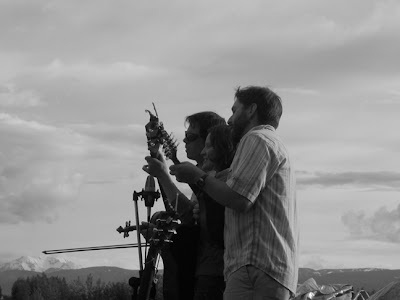 I was determined to take away as much from my time in Alaska as possible. 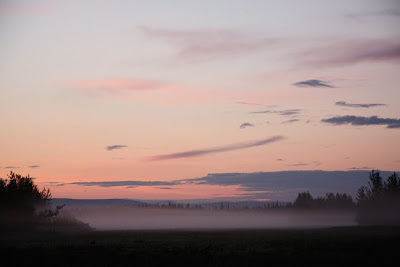 My time spent there this summer has lit a fire inside; I am thinking that perhaps a period of time spent working on paintings up in The Yukon or Alaska might be a great opportunity. It will take resources, time and planning but I have started to formulate the idea in my mind and I think it will come to pass. Who knows how the energy of the North might influence my work? The landscape is unmistakably beautiful up there, yet it is those connections with people who gather there, who make it what it is through community and relationships, THAT is what makes places unforgettable...the rest is a gorgeous stage. It is the players that matter most. Connection is everything because everything is connected.